On her wedding day, Lady Eleanor de la Tour learns she must wed the new earl, recipient of her betrothed’s title and lands. Richard Courtenay is intriguing, but she wants the man she loves. And Richard pursues alchemy, anathema to her. 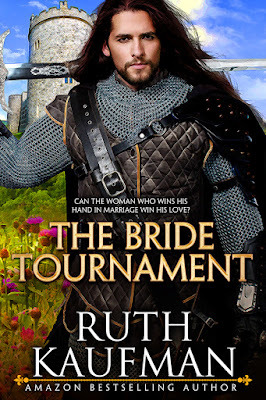 Richard needs to uncover her father’s alchemy secrets and vows to win her even as she arranges a bride tournament to find him a better, and willing, wife. Can they attain what they most desire? This was how a deer must feel before the arrow hit. Before Eleanor stood Arthur Stafford, his familiar face expressionless. Her heart melted with sympathy for all he had lost. As her guests buzzed louder than a swarm of bees, Eleanor forced her gaze from the man she longed to marry to the man she must marry. The new earl stood taller than Arthur. She had to tilt her head back to see his high cheekbones, straight nose and square chin. A face more chiseled than the one she loved. Wild waves of dark brown hair fell to his shoulders. Richard’s eyes were an unusual mixture of gray and green, not light blue. He was handsome in the way of a rugged warrior, not elegant like the man she’d hoped to marry. His voice was sonorous, rich and smooth like his fine velvet garments. He crossed his arms, one brow slightly raised. A challenging gleam sparked in his eyes, as if he expected her to do something rash. To test him. Edmund de la Tour beamed, arms resting on his slight paunch. He patted her on the back then left her to face the earl alone. Eleanor felt scores of eyes on her, watching, waiting to see whether she’d accept this new earl. Arthur had disappeared. She just couldn’t bring herself to make the best of the situation as he was doing. “I am needed elsewhere, my lord.” She gathered her heavy skirts and turned. Richard whispered in her ear, “Consider this. Whatever you do this day shall be returned ten-fold.” His warm breath sent a tingle up her neck. She whirled with a huff. “How dare you?” Lifting her chin, she met Richard’s intense gray-green gaze. “Other women may submit to a man’s commands, but no man controls me,” she hissed. With his broad shoulders back, his square jaw set, he looked powerful and forbidding. Like a man accustomed to getting his own way. Worse and worse. What was she to make of his warnings? This earl already proved a formidable opponent. She would best him, somehow, and remain true to her goals. All around her guests whispered, clearly craving a scandal. “Will she wed with Courtenay?” a woman behind her asked. They’d turned her life’s upheaval into a wager. Had her face flushed from discomfiture she could barely contain. She bit her lip. A muscle twitched in the earl’s cheek. He had heard. What did he know of her? The music started up again. They stared at each other, two soldiers trying to hold a bridge, neither willing to give an inch.